Here are some pictures of a 3DMark Vantage Competition (single GPU competition) hosted at Kingpin’s forums. 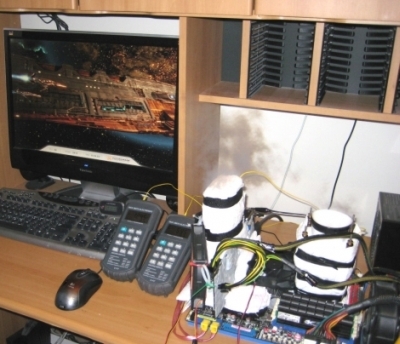 All participants have used a Radeon HD 5870 (from MSI and ASUS). The winner is an overclocker nicknamed Deanzo with a score of 24486 points. The stock speeds of his Radeon HD 5870 (from MSI) are 850MHz (gpu core) and 1200MHz (memory). Thanks to LN2 (or liquid nitrogen), this Radeon HD 5870 has been overclocked up to 1380MHz for the GPU (530MHz in more!!!) and 1350MHz for the memory.